Remember when the market rallied sharply last Monday? Most investors thought it was due to growing expectations that Hillary Clinton would be the next president after FBI Director James Comey cleared Clinton again after another probe of her emails. The big surge on November 7 snapped a nine-day losing streak for stocks that many attributed to Donald Trump's newfound momentum. Wall Street had decided Clinton was going to be the next president -- and they wholeheartedly approved. So the fact that the market continued to rally last week after Trump won is, in some respects, even more surprising than the fact that he won in the first place. The Dow jumped nearly 600 points -- a 3.2% gain -- in the three days after Trump's victory. It was up again Monday and hit a new all-time high in the process. The S&P 500 and Nasdaq also moved a bit higher after Trump's win. Are investors now too complacent? Sure, there are reasons for the market to cheer the Trump win. A Republican in the White House and Republicans keeping control of Congress increases the chances of a bill being passed that would lead to more infrastructure spending. There may also be less regulations on health care stocks and financials. Unsurprisingly, industrial stocks like Caterpillar (CAT), big pharmaceutical companies such as Merck (MRK) and Pfizer (PFE) and giant banks JPMorgan Chase (JPM) and Goldman Sachs (GS) rallied sharply last week. They are all in the Dow too. Expectations of higher spending by the federal government are one of the main reasons why bond investors have sold U.S. Treasuries to buy stocks. The selling pushed yields sharply higher since bond prices and rates move in opposite directions. 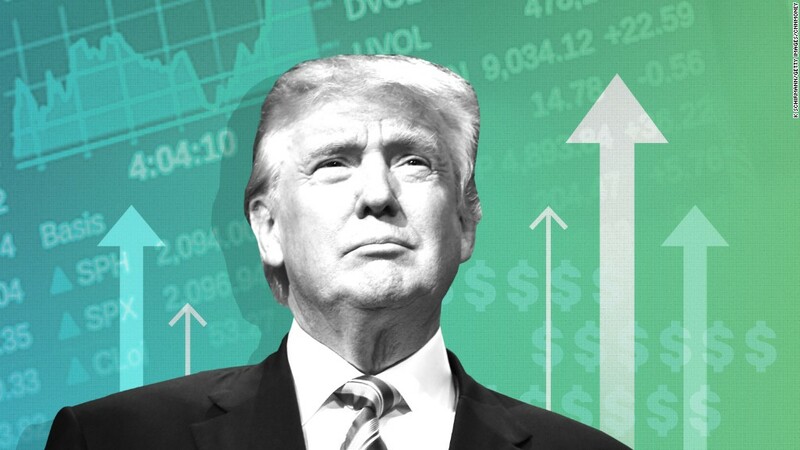 Still, several market strategists expressed concerns that the market is underestimating the possibility of Trump rattling the markets during his time in office. He remains highly unpredictable. Just this past weekend, Trump vowed in a "60 Minutes" interview that he would not use Twitter as much as he did while campaigning -- but wound up launching a series of tweets attacking The New York Times for its coverage of him. "It is worth asking whether investors are, yet again, underestimating uncertainty," said David Kelly, chief global strategist with JPMorgan Funds, in a report Monday. "While Mr. Trump's tone has been conciliatory since the election, his many changes of position during the election campaign beg the question of how aggressively he is going to pursue his stated agenda," Kelly added. Trump's anti-immigration stance could also be a big problem for U.S. tech companies, which have attracted a lot of talented foreign workers due to the H1-B visa program. Will Trump seek to end that? That may be one of the reasons why big tech giants Apple (AAPL), Amazon (AMZN), Facebook and Google owner Alphabet all fell last week. Silicon Valley is very wary of Trump -- and probably with good reason. After all, Trump waged a Twitter war with Amazon CEO Jeff Bezos because he wasn't happy with the coverage he was getting from the Bezos-owned Washington Post. A Trump war on tech could be bad news for the market and economy. The tech sector is now one of the most important industries in the United States. Apple, Google, Facebook and Amazon are among the most valuable companies on the planet. So even though tech stocks zigged while the rest of the market zagged last week, that probably can't go on indefinitely. Prolonged weakness for big tech companies would have a negative impact on the whole market over the long haul. There's also the issue of how much Trump will actually be able to accomplish. Yes, Republicans control Congress. But House Speaker Paul Ryan wasn't exactly the biggest Trump supporter during the campaign. There could be more roadblocks to Trump's plans than expected on Capitol Hill. "It is also hard to believe that Trump won't experience opposition in implementing policy. Trump and opposition are words that go hand in hand," said Mike O'Rourke, chief market strategist of JonesTrading, in a report Monday. The title of O'Rourke's report also summed up the rapid shift in sentiment. "Trumpageddon to Trumptopia." Now this isn't to say that the market definitely is due for a crash during the Trump administration. But experts think investors may now need to take a step back and remember that there still isn't a lot that the market knows about possible Trump policies. "There remains a great deal of uncertainty over what type of president Trump will actually be. In an election that was dominated by coverage of tweets, videos and emails, policy questions received surprisingly little airtime," said Andrew Sheets, a strategist with Morgan Stanley, in a report Sunday. "Those questions are now crucial for markets. To a remarkable extent, investors we've spoken to both before and after November 8 disagree on what President-elect Trump will actually do," Sheets added.